The Heavens Declare the Glory of God! But . . . 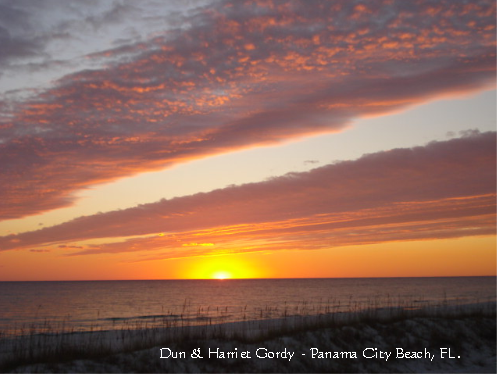 This sunset that Harriet and I enjoyed on our beach last night sure illustrates The truth of Psalm 119:1. But as we enjoyed it, we realized that the one thing the heavens do not declare is the Gospel of Grace. God has given us that blessed privilege. Let us be faithful to tell the world that only Jesus saves! We don’t get the beautiful colors of changing leaves that many have enjoyed this season, but our Lord’s paintbrush is not only active in the Smoky Mountains or in the Rockies of Colorado. And the whole heavens over our Gulf of Mexico can’t even contain it all. What a mighty God we serve! If our sunset is this beautiful, what is heaven itself going to be like! Posted on November 9, 2010 by Dun Gordy. Bookmark the permalink.